The dreaded call to a customer service helpline, where one has to hold the line for several minutes, if not hours, is an experience that all of us have faced at least once in our life. It is quite surprising that such customer service anecdotes aren’t the worst of the kind! Customers have experienced even worse things. Remember the repulsive act of forcefully pulling a passenger out of one of United Airlines’ flights? Perhaps that story is one of the worst customer service nightmares of recent times. Such experiences have been shared aplenty on the internet. As disappointing as they might be, there is something to learn from such bad experiences too. I am sharing two of such customer service nightmares and what we can learn from them. As per Fortune, the tales of United Airlines’ poor customer service started coming to surface with this music video that was posted by @DaveCarroll in 2008. To be frank, the song is quite catchy apart from being very funny! Dave Carroll used some great music to share the woes of his broken guitar. The video has been watched twenty million times and is liked by over hundred thousand people. It’s said that the internet never forgets! This has been true for @united because even after almost a decade, this video keeps resurfacing. 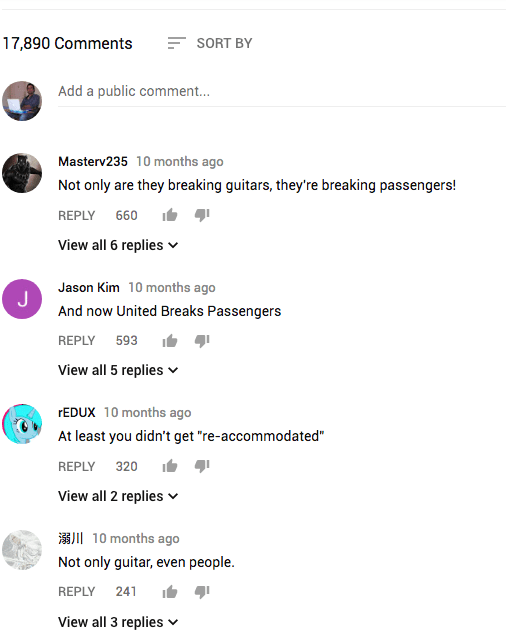 Here are some of the comments on the video after the indecorous incident of United Airlines forcefully deplaning a passenger was reported last year. The lesson for brands is to understand the power of social media and the internet in today’s world. Any unpleasant customer service experience will not stay hidden from the world. Jeff Bezos, one of the most customer-centric leaders in the world has rightly said: “If you make customers unhappy in the physical world, they might each tell six friends. If you make customers unhappy on the internet, they can each tell 6,000 friends.” However, it is important to remember that people will also share positive things about a brand if it goes beyond its means to deliver a great customer experience. ‘Please know that despite the fact that wedding couples love Hudson and our inn, your friends and families may not, ‘says the hotel’s website. I am a big proponent of customer reviews. They help prospective buyers make an informed buying decision while also showing a mirror to the business. A business can choose to mend its flaws that are uncovered through customer reviews, thereby improving the customer experience. Alas! It looks like not all business owners believe so. Instead of fixing the customer problems that lead to negative reviews, I am wondering how any company can even think of making money from the negative reviews! Obviously, this didn’t go down well for the Union Street Guest House. Hundreds of negative reviews have been posted against the guest house because people were outraged by the guest house’s policy. The lesson here is to never have any policy that stops people from giving you negative feedback. Negative feedback is the only source of information that tells what should be done to improve customer experience. Not only should companies encourage customers to leave negative reviews/feedback, but they should also use the same as an opportunity to improve their relationship with the customers. This is sure to lead to selling more to the customer! What has been your worst customer service story? Do share it with us!